Many current programs of studies require students to develop skills that enable them to become involved collaboratively in social action for the benefit of their communities and the world. 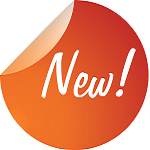 This edition of School’s In examines non-profit and charitable organizations. In particular, how can the work of these organizations be analyzed to reflect curricular outcomes and provide a vehicle that enables students to become involved in local and global social action? Do you ever think that what you do in school has no connection to your life or to the world that you live in? Do you ever think that your completed assignments are only for the teacher to read, and that what you think means absolutely nothing to anyone in your class or community? Do you ever think that you cannot make a difference in the world? Well – times are changing! Current social studies and science programs, and, perhaps other subjects, now ask you to become involved in projects that may result in some sort of social action. Social action means you become actively involved in order to change what currently exists. One way for an individual or class to begin social action is to join or support an existing charitable or non-profit organization – one that has already set the groundwork necessary for change. a. Below you will find the internet sites of five non-profit organizations that might assist your class in participating in a social action project. b. Read the included overview of each of the sites. c. Individually, or by dividing the task, evaluate the sites using the following questions as guides. d. Share your findings, and, as a class, decide if joining one of these charitable organizations would be an effective method of your class being involved in social action. Evaluative Questions: For each site, write short responses to the evaluative questions below. 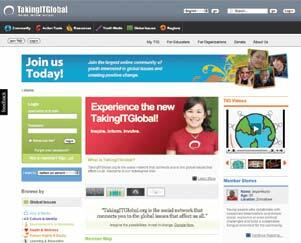 Do you think that this site would assist your class in becoming involved in social action? Why? Do you think that this site fosters global or national collaboration and communication? How? Do you think this site appeals to young people? Why? Do you think that the participants on this site have the potential to cause significant changes in the world? How? Is this site connected to a non-profit organization or charity? If so, which one? Do you think that your class would benefit from belonging to this site’s membership? Why? Founded in 1995 by international child rights activist Craig Kielburger, Free the Children is the world’s largest network of children helping children through education. The organization has one million youth involved in its innovative education and development program. The primary goals of the organization are to free children from poverty and exploitation and free young people from the notion that they cannot effect positive change in the world. The We Generation area of the Free the Children site enables students to learn the facts, get involved and share information. It offers you as students a place to expand a project that might have emerged from a class inquiry or ideas. The We Generation is free – check it out – here you may find all the tools you need to make a difference. Projects thus far have included building schools, shipping medical supplies, improving access to clean water, and advocating changes to current laws. Youth action groups have been started in more than 1,000 schools across the Unites States and Canada. b. ACCESS Charity: Allowing Children a Chance at Education with School Supplies, Inc.
were sent to the Dominican Republic to assist hundreds of impoverished children, who would otherwise be unable to attend school. 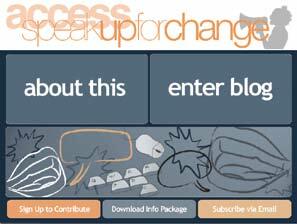 Speak Up for Change is an initiative of ACCESS Charity that gives both youth and adult guest contributors a chance to write about poverty and education-related issues. It provides students with writing experience and online exposure, as well as community service hours and prizes. Topics include social justice, youth activism, global development, poverty, education, political action, and more. It is estimated that globally 1.5 million new blog entries appear in one week. Speak Up for Change encourages as many positive, youth-written, change-driven posts as possible and assists in channeling those posts into action. 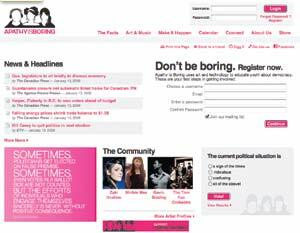 Apathy is Boring was born in January 2004 to fill a gap in Canadian youth representation in politics and democracy. The original three young founders saw that many of their peers felt disengaged from the political process. They wanted to see youth voting rates increase and to combat youth apathy. The site uses art and technology to engage youth and is the entry point for young people into lifelong active citizenry aimed at increasing youth representation in politics and eliminating youth apathy. As a student you can join a mix of creative, content-driven projects that engage, motivate, educate and provide a vehicle for change. This site offers an online resource and a community in which you can connect with each other all across the country. 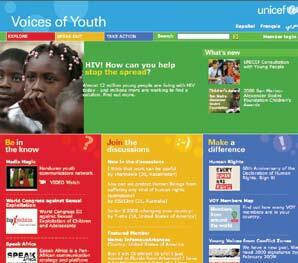 The Voices for Youth is a page specifically designed for youth that has been added to the original UNICEF page. UNICEF Youth Voice provides a platform for young people to speak up and help create a world fit for children. By joining this page, you get a chance to speak up for children who don’t have the chance to speak up for themselves. Real-life stories and articles come directly from children or young people. You are able to join in the discussions on many issues that plague children and join in projects to address them. Do you know that there are significant global issues, that young people are the world’s largest untapped resource, and that young people lead the world’s information society? Do you realize that youth appreciate technology’s potential to connect with other cultures and viewpoints? Taking these facts into consideration, this site was created to enable youth to participate in and contribute to the global society they will inherit. Through this site you are able to connect, take action, access resources, and acquire tools to help in social action. Charities and non-profit organizations are themselves subject to laws and regulations. 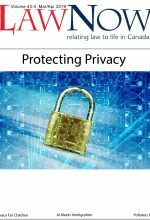 Using the website www.charitycentral.ca, list and present facts that impress you about the definitions of charities, non-profit organizations and the law. Do you agree that charities need specific laws in order to be effective? Lorine Sweeney, EdD is an educational speaker and writer with a background in curriculum and instruction.